Apple and Tim Cook Honor Dr. Martin Luther King, Jr.
Apple today has honored Dr. Martin Luther King, Jr. with a full-page tribute on its website. 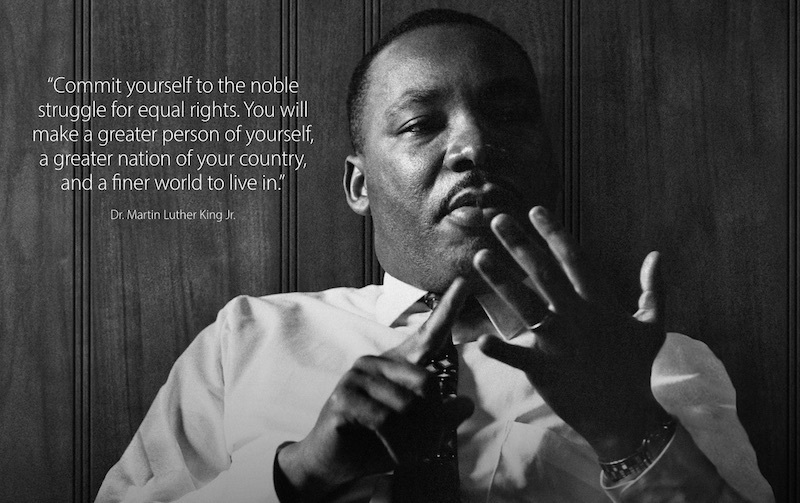 A photo of Dr. King is accompanied by a quote of his: "Commit yourself to the noble struggle for equal rights. You will make a greater person of yourself, a greater nation of your country, and a finer world to live in." Apple CEO Tim Cook also tweeted a photo of Dr. King and said "we honor [him] by working to help achieve justice and equality." Today is Martin Luther King Jr. Day in the United States to commemorate Dr. King around his birthday. The iconic Civil Rights Movement leader would have turned 88 years old on Sunday. I wish Apple had no political agenda and social justice goals to pursue. Apart from self advertising and getting people to view Apples products, I'm struggling to see the connection here between a giant American consumer electronics corporation and Mr King Jnr's death? It amazes me that even this front page image can bring negativity. Apart from self advertising and getting people to view Apples products, I'm struggling to see the connection here between a giant American consumer electronics giant Mr King Jr's death? Normally, I count myself among the most cynical of individuals. In this case, I really can't find a reason to doubt Cook's sincerity. Love him or hate him, Cook's pretty transparent about his social justice stance. Honoring Dr. King fits that profile. This is what I love about Apple and I have the strong believe and feeling this is not pure marketing but what the people leading this company stand for and believe in. MLK was the man, great men like him, Malcolm X and Mohammed Ali, need to be remembered fight against racism. A picture on a website with a silly quote. All that money overseas could have been spent backing a candidate whom wanted more equal rights. Its all smoke and mirrors. Lets stick to the computers and stuff Tim.